Recently I have been reading some back-and-forth discussion on Three Pipe Problem regarding interpretations of Giorgione's Tempest (c. 1505, shown right). Whenever I teach this painting to students, I give some background on the extant interpretations and scholarship, but I have never promoted one theory above another. The reason? In my opinion, it's just too hard. I haven't found one interpretation that completely satisfies all of my questions regarding the enigmatic subject matter and composition. One of the more popular arguments is that this painting is a Flight into Egypt scene, although that argument still leaves me with some questions. 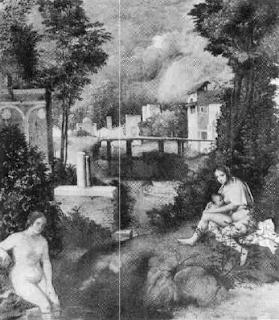 X-ray scans of the painting reveal that Giorgione first painted a woman on the left side of the painting (see below, as reconstructed by Morassi in 1939), and then later changed his mind and painted the woman on the right (which is why both women appear in the x-ray scan. For someone who is familiar with the final painting, this scan almost seems creepy at first glance, since the male figure eerily nonexistent.). Anyhow, the woman revealed through x-ray is not holding an infant, nor is she positioned so that an infant could have been painted in her arms afterward. This suggests to me that the female figure was not initially intended to be a Madonna (at least for a Flight of Egypt scene, since Mary is always depicted as the one holding the Christ Child). Giorgione obviously could have changed his mind afterward in regards to the subject matter, but this initial female figure makes me wonder if the painting was intended to be (and still is) secular in nature. 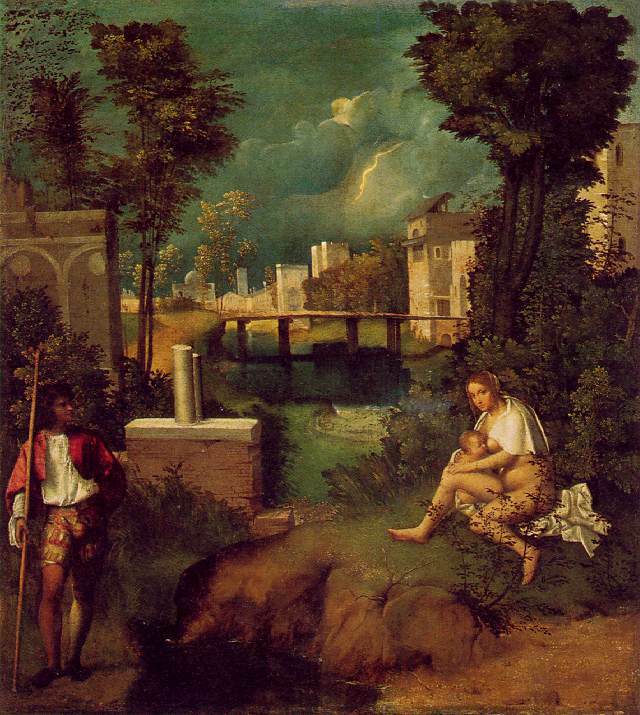 Do you latch onto a certain interpretation of Giorgione's Tempest? Why? 1 Paul Holberton, "Giorgione's 'Tempest' or 'little landscape with the storm with the gypsy': more on the gypsy, and a reassesment," Art History 18, no. 3 (September 1995). Available online here. Holberton isn't the first person to put forth the gypsy argument, but I like much of the logic and ideas that he presents. I also like that Holberton discusses a little bit of the historiography of the Tempest, which makes this article a useful resource for scholars. 2 Ibid. Available online here (p. 14).